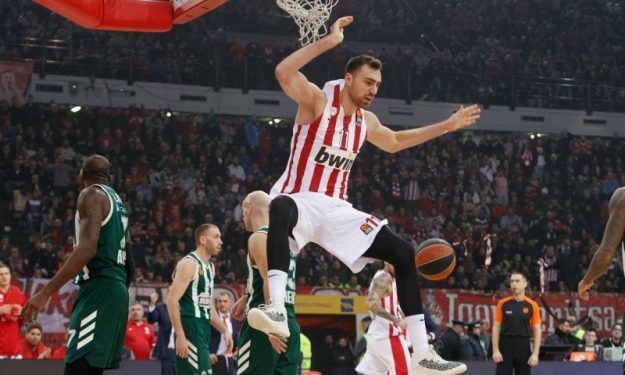 Nikola Milutinov had a night to remember against Olympiacos’ rivals, Panathinaikos OPAP. The 24-year old center is having a great year for Olympiacos Piraeus and his latest performance against Panathinaikos OPAP simply says it all. Nikola Milutinov led his team with a monster double-double -flirting with a 20/20 game- past Rick Pitino’s side in a historic rebounding effort. At the half-time break, Milutinov had already registered a double-double, but he did not stop there. He not only scored 18 points (5/8 FG) (8/10 FT), but he also grabbed the most rebounds in Olympiacos‘ team history in the EuroLeague with 18, which is also a EuroLeague season high. Dino Radja held the previous record for Olympiacos with 17 boards. Milutinov also scored a game-high 41 PIR, marking one of the best EuroLeague performances of the year. It’s also significant to note that he did not commit a single foul.